The TeraFlex JK Jeep Wrangler (Rubicon) Heavy Duty CB Antenna Tire Rack Mount is designed to mate seamlessly with JK Wranglers. This TeraFlex CB mount preserves the factory lines of your Wrangler, providing an efficient and practical antenna locator. No need to drill additional holes in your Jeep''s roof line is essential for best radio performance and the TeraFlex JK tire rack CB mount provides one of the easily solutions for Wranglers on the market today! 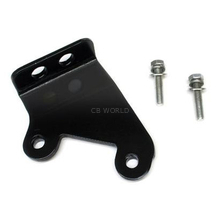 CB World's TeraFlex tire rack mount is best when combined with the ProComm HS818TN-NIP high quality 18 foot weatherproof CB antenna cable kit and a K4R stud. It is a weatherproof coax cable that is flexible but tough and complete with removable PL259 connector for ease of cable routing to radio connection. A heavy duty antenna stud completes the coax assembly. Be sure to secure extra antenna coax by winding in a wide figure 8, not a tight round coil.